In Turkish cuisine, ‘meze’ (meh-ZAY’) is a group of foods served as a series of appetizers or starters before the main course arrives. If you’re dining out, ‘meze’ dishes are often so plentiful and delicious, they end up overshadowing the rest of the meal. You can usually expect two rounds of ‘meze’ before a meal of meat or fish. Cold ‘meze’ dishes, most often made with fresh, seasonal vegetables, are served first, followed by a round of hot ‘meze’ selections. Hot ‘meze’ features meats, seafood morsels and cheeses, and dishes are often fried. A classic example of hot ‘meze’ is called ‘sigara böreği’ (see-GAR’-ah BUHR’-ay-ee). This dish is a good old standby at nearly every restaurant and in every home kitchen. It’s found everywhere and loved by all. In Turkish, ‘sigara’ actually means ‘cigarette.’ These pastries got their name due to their long, thin, rolled shape. But the resemblance stops there. These delicious rolls of fresh ‘yufka’ dough filled with Turkish white cheese, similar to Feta, are good for you and your taste buds. You can also experiment with different Turkish cheeses and other fillings like seasoned ground beef, Turkish pastrami, called ‘pastırma’(pah-STIR’-mah) and spicy beef sausage, called ‘sucuk’ (soo-JOOK’). You can always serve ‘sigara böreği’ as a starter, along with other ‘meze’ dishes to complete your Turkish-style menu. They also make great, make-ahead snacks for kids. I like to fry up and batch during the day and have them ready for after school munching. They also work well as salty, crunchy finger food at parties. Try passing around a platter of freshly cooked pastries and watch them disappear. Here is the basic recipe for making Turkish ‘cigarette’ pastries. You can find ‘yufka’ in Mediterranean grocers and on websites selling Turkish ingredients. If you have extra time and can afford some elbow grease, you can roll out your own ‘yufka’ sheets. 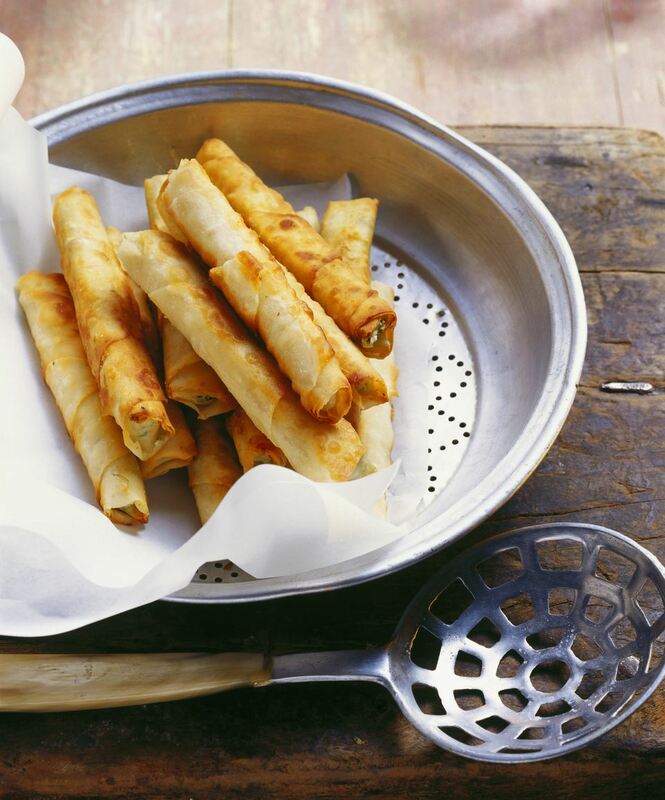 If you can’t find fresh or frozen ‘yufka,’ you can also use frozen phyllo pastry sheets. Use two or three sheets at a time to make the dough thick enough for rolling. If you’re using round ‘yufka’ sheets, use a pizza cutter or sharp knife to cut them into triangles. Divide each circle into eight to ten triangular slices like you are slicing a pizza. The wide base of each triangle should be about four to five inches wide. If you are using frozen phyllo, thaw it gently according to the package directions. Here are some tips on working with frozen phyllo. Using two phyllo sheets, one on top of the other, begin at the center point of one of the short edges. Cut diagonally down to the left bottom corner. Starting again from the top center point, cut diagonally down to the right bottom corner. This will give you three pastry triangles from each rectangular sheet. In a small bowl, crumble the white cheese or Feta with your fingers. Add the chopped parsley and salt and pepper to taste. Take a pastry triangle and position it so the wide end is at the bottom and the point is pointing away from you. Spread about a tablespoon of the filling in a thin line near the bottom edge, leaving about one-half inch empty on each side. Before you begin rolling, fold the bottom right and left corners of the pastry toward the center to cover the edges of the filling. This will trap the filling inside as you roll the pastry up. Using your fingers, gently roll the pastry away from you toward the point of the triangle. Try to tuck in any open edges as you go along. When you get to the end, wet the inside of the point of the triangle and stick it to the roll. This will seal it keep it closed as it fries. Heat about two inches of oil to frying temperature. Add several pastries to the pan leaving some space in between them to prevent them from sticking to each other. Using prongs or a fork, move them around as they fry for a more even color. When the ends begin to brown, flip them over and let the other side cook. When the pastries are done, they should be golden-brown all over with darker ends. Drain the pastries on a thick layer of paper towels before serving.